Veneers are the ideal solution if you are seeking a complete smile transformation. For a whiter, brighter and more symmetrical smile, this cosmetic treatment creates long lasting and noticeable change. At Northway Dental Practice, we pride ourselves on working closely with patients to understand their needs and cosmetic aspirations. It’s important that we provide patients with the right advice and treatment to enhance their dental appearance. We have extensive experience in fitting veneers that create an impact and have successfully treated a number of patients with excellent results. Whether you want to cover one front tooth or change the appearance of multiple teeth, veneers are reliable, effective and long lasting. They are also effectively used to mask discoloured teeth, correct small gaps, misshapen teeth or to disguise broken or chipped teeth. 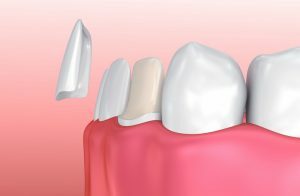 A veneer acts like a cap or cover for your natural tooth. It can be made from composite resin or porcelain and is cemented directly on top of the natural tooth to completely cover the enamel (visible part of your tooth). Used on the front teeth, veneers are built by our laboratory team to your individual specifications and desired brightness. While some preparation is required on the natural teeth, this is significantly less invasive than the preparatory work required for when you need a crown. Your natural teeth will be shaved or filed to prepare them for the veneer. To book a cosmetic dentistry consultation, please click here or call 0151 526 2701.